Nothing was more insulting in the past decade than the 2009 Fort Hood shooting that left 13 servicemen and women dead and the 2013 Navy Yard shooting that left another 12 dead—in both instances a massacre of the men and women that had taken an oath to protect us and this great nation. Many of these people w ere trained to fight for freedom. But instead on November 5, 2009 and again on September 16, 2013 these heroes were defenseless, not having the necessary tools to properly fight back and defend themselves. Several victims at the Fort Hood shooting rushed at the attacker only to be cut down with a wall of bullets. The question must be asked: why are those who are thoroughly trained and sworn to defend this country and its people not trusted to carry weapons for their own defense? Fortunately, in January of this year the U.S. Air Force sent out a letter to base commanders reminding them of their authority and of the ways in which they may permit service members to carry weapons while on base—on-duty or off-duty. 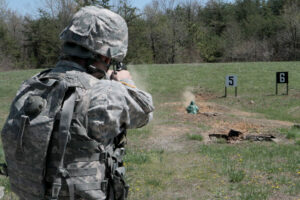 The Air Force has established the Unit Marshal Program where security forces work together with and train Air Force members to allow them to carry their service pistol at their duty location. This program has actually existed for some time, but it was just recently that the Air Force decided to remind base commanders to utilize the program. The reasoning for this emphasis was a full security review done by the Air Force that determined if individuals involved in the previous mass shootings had had weapons at their disposal that they might have stopped or prevented the perpetrators from committing their acts of terror. In the Fall of 2015 Congress looked at and debated the possibility of passing a bill that would have broadened the rights of military members to carry and possess firearms while on military installations. The bill unfortunately did not work its way through the process and died amid funding measure veto threats by President Obama. Thank goodness the Air Force saw fit to do what they could to encourage their personnel to arm themselves. We can only hope the other branches will follow suit. Why is a bill required by Congress only for Obama to veto it? Prior to Bill Clinton, service members were allowed to carry firearms on base. With the Clinton presidency, the war on the military started. Congress can rescind that bill that Clinton signed into law! Not only allow members of the military who are properly trained in the proper use of a sidearm carry on a military installation, but allow civilians who have concealed carry licenses and are proficient in the use of a sidearm to also carry concealed while visiting a military installation, unless they are going to a Secure area.